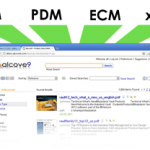 I came across a discussion on the Information Access and Search Professional Group on LinkedIn that was started by Cate Evans of Concept Searching. 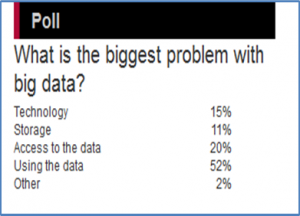 The discussion, which carries the same title as this blog, references a research study about Big Data benefits and challenges as seen by organizations that implemented it. The research was done by the Ventana Research and Mark A. Smith of the same organization wrote an article about it. What was interesting to me was the fact that 44% of the companies found Big Data to be very expensive, which highlights some of the things that I talked about in my comment on the aforementioned LinkedIn discussion thread. The way I’m seeing it around industries that I’m talking to and how people are talking about it in the various types of media, Big Data carries a different meaning to different people. To some, it’s a simple dashboarding and reporting exercise that helps them make sense of the sea of data that they are swimming in on a daily basis, and to others it’s the mining of structured and/or unstructured data on a real, or near real, time basis then analyzing it, adding some prediction and trending to it, with deep advanced search and display tools on top of that. No matter where organizations are within the definition or understanding spectrum of Big Data, they are going to be generally split into two groups: one group is where companies have taken the plunge and implemented Big Data, those are typically the large corporations with large IT budgets, and the second group are companies watching on the sidelines and possibly implementing an element or two of Big Data that makes a good business case for them with a defined, realistic ROI. 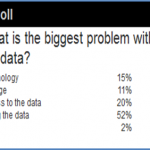 One of the big challenges that Ventana Research have seen when polling visitors to their website about the biggest problems with Big Data was “Using the Data,” with more than 50% of those polled answered as such. Other possible answers were: technology, storage, access to the data, and other. A snap shot of the answers as it stood on 3/4/2013 is shown in the diagram attached herein. I’m of the opinion that Big Data is still in its embryonic stage, but that shouldn’t stop organizations from implementing elements of Big Data that make good business sense to them. http://www.alcove9.com/big-data-new-research http://www.alcove9.com/big-data-new-researchThere are many aspects of Big Data that can be “modularized” and implemented in chunks so companies can take advantage of mining data, searching structured and/or unstructured data, visualizing results and reports, or accessing what they need when they need it, whatever has a good ROI for their business. Just like what PDM/PLM went through, the definition of Big Data is going to stabilize and soon thereafter all lessons learned and best practices will be incorporated so organizations, big and small, can start taking advantage of it. Until then, take small bites of Big Data implementations with defined business case and realistic ROI to start chipping away at the issues tackled by Big Data solutions.